In late 2010 Darren Woolley, MD of TrinityP3 decided to take an informed risk. He believed that the future of business was tied to inbound marketing strategies – particularly SEO, content marketing and social media. Out the window went traditional advertising, lead generation services, cold calling and paid search engine marketing. 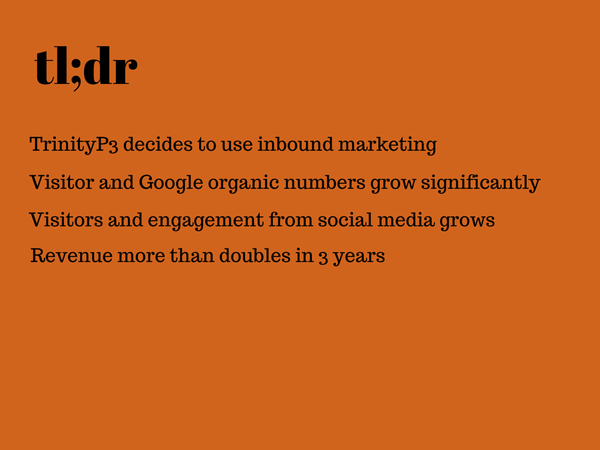 TrinityP3 embarked on an integrated inbound strategy in early 2011. These are the results of this bold move and I will share a blow by blow account of the strategies used for TrinityP3 to more than double its revenue in just 3 years. There is a lot of debate about the return on investment for digital marketing strategies, particularly when it comes to content marketing and social media marketing. So, at the end of 2014 we published a 27,000 word ultimate guide to assist marketers in navigating the tricky waters of digital marketing. Many experienced marketers are struggling to identify the important metrics and to demonstrate real value from their efforts. There is so much conflicting information out there that it can be difficult to work out who really knows what they are talking about. In May 2013 I published this post which tracked the correlation between 300% website visitor growth and an increase in revenue of 38% for TrinityP3. Considering the GFC and tough conditions in the business environment at the time, this was a very useful demonstration of the effectiveness of inbound marketing when all elements are managed carefully. It is now time to update this case study and share with you what we have worked on, our processes and strategy and what the results look like in real terms – increased revenue. So, we are sharing our “secret sauce”. Are we crazy to give away the step by step process to achieve B2B growth through inbound marketing? Not at all. 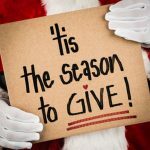 If you are a regular reader of this blog you will already understand our commitment to sharing the knowledge. “Knowledge is power” has been a philosophy for TrinityP3 right from the start (15 years ago) and the new connected web offers exceptional opportunities to help others and to build a reputation for thought leadership by sharing insights. More on that later. First up I will share our analytics and financial results and then I will give a comprehensive account of how we achieved this. Let’s look at TrinityP3’s results at the beginning of the project. 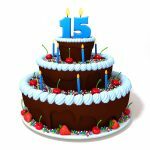 Despite Darren Woolley publishing a healthy amount of content on the blog between 2007 and the start of 2011 the blog was still unknown (and only had around 300 visitors per month). Social media efforts went largely unrewarded and follower and connection numbers other than on LinkedIn were low – 200 followers on Twitter, no company following on LinkedIn, a handful of people on Facebook. Engagement was almost zero- no comments, mentions and very few shares. By applying an intensive inbound strategy we have grown all of these figures significantly over the past three years. The 3rd year saw slower growth as we were beginning to hit some pretty big numbers for a specialist niche site. 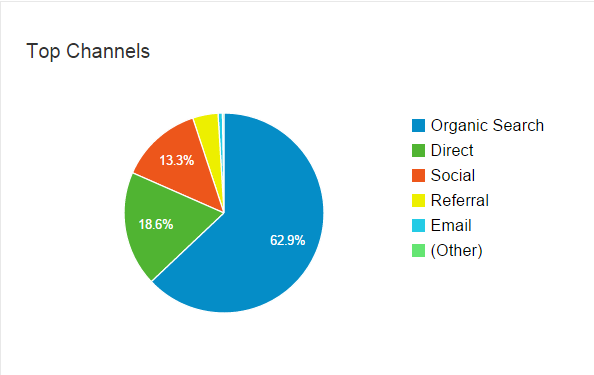 A substantial proportion of these visitors are arriving from Google Organic search. I will explain the why and how in the strategy. And a useful number of visitors are coming from social media and brand awareness, repeat visitors, dark social and unmeasured search traffic in the Direct traffic segment. If we dig down on what the actual sources are we can see who the big players are. Check out the difference between Google and its nearest rival Bing. 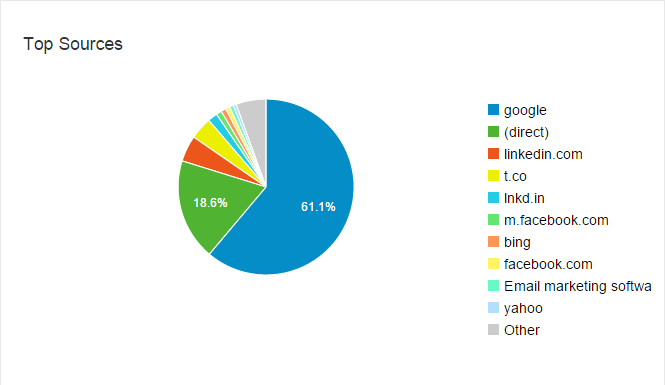 LinkedIn (linkedin.com and lnkd.in) is TrinityP3’s best social performer with Twitter (t.co) not too far behind. For those who still dismiss Twitter as the “celebrity” channel this might change your mind. Let’s look at billings based on the last 3 financial years. After a negative result the previous year this is a big turnaround. Before you say “Hey, that’s not double, that’s only 89%”, you need to factor in compound interest (Darren kindly pointed this out after viewing my first draft). The 3 year growth percentage based on actual revenue is 115%. It is interesting to observe that the reduction in percentage terms in visitor numbers does not have an impact on growth in revenue. 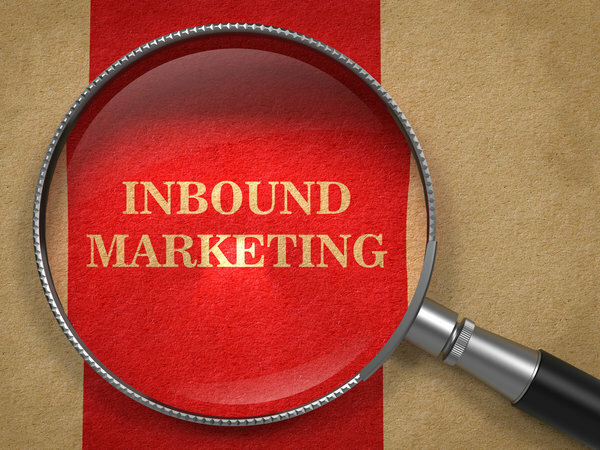 The advantage of inbound marketing is that your efforts are cumulative. Every piece of remarkable content produced, each high quality link earned, each citation you get, every social interaction, every SEO improvement all add to the overall value of what is being created. So, let’s take a look at how this strategy works. The basic premise is a combination of four connected and complementary strategies which all serve to boost the performance of each of the others. Any inbound or content marketing strategy that does not factor in SEO is doomed to failure. SEO must be the foundation and a high level of understanding of this extremely complex and rapidly changing area is essential. This is very closely connected to SEO. Making sure your website is fast, efficient and offers a great user experience ensures a good reputation with search engines and visitors. The production and optimisation of high quality, in-depth content that satisfies your audience’s needs is the engine room of a successful inbound strategy. If your content does not make the grade or if you miss some of the critical optimisation points then you may as well not bother. There are a couple of elements at play here – reach and engagement. A large, highly motivated network will serve to promote your content for you. This advocacy takes some time to build and strategy should constantly be reviewed, tested and adjusted. SEO is quite simply the art and science of achieving search engine visibility by implementing a range of tactics that contribute to higher page positions. There are several approaches to this from high risk to full guidelines compliance. 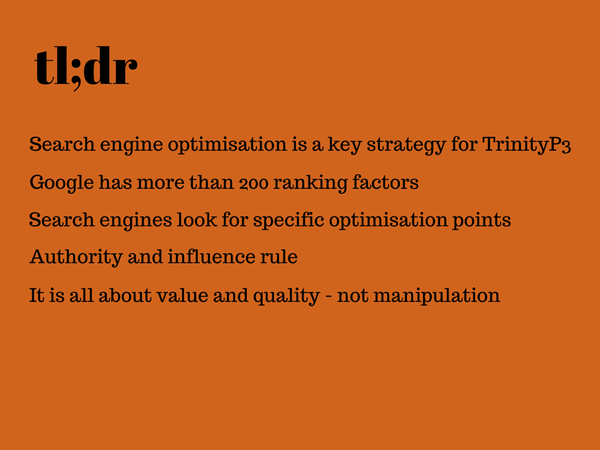 With the TrinityP3 strategy we have always been careful to stay well within Google’s guidelines and have focused on quality and value rather than tricks or hacks. There are more than 200 ranking factors and Google has stated that there are approximately 50 variations for each of these (making 10,000 signals!). When this was announced it may have had something to do with a signals bidding war with Bing so we are really none the wiser on the voracity of this claim. So, lets stick with 200 factors at this stage. Over the past 4 years we have made many adjustments to our SEO strategy. Often Google will telegraph in an obscure way what they are about to implement and it is up to us to interpret these cryptic offerings and to follow the thought leader discussions to make a decision on any changes to policy. Sometimes these changes are just as expected and other times the entire SEO industry goes into shock when a major update targets an unexpected area. The easiest way to avoid having to be reactive is to examine each tactic and ask whether it is 100% ethical and whether what you are doing is adding value or an attempt to be manipulative. These are the key elements of our SEO strategy – this has been trimmed back to the most important elements. The URL of a page is very important. Every page on the site should have a clean, clear URL that describes what the page is about. It should not have capital letters, special characters, underscores or dynamic characteristics. URLs that are overly long will also lead to problems. Unnecessary stop words should be removed. So an ideal page URL will look like this one for “Agency search and selection”. Title tags or SEO titles are one of the key areas that search engines look to when establishing the theme of a particular page. There are a number of best practice principles which must be followed in order to gain maximum benefit. The old “wild west” days of stuffing keywords into title tags will do nothing other than see you penalised for spammy behaviour. I still see many sites using the unhelpful “keyword | keyword | keyword” formula in titles. This not only looks bad in search results, it also makes the page look spammy when shared on social media. The title must describe accurately what the page is about. Relevance is the key here. It must be compelling (does the title make you want to read more?) so short form copywriting skills are valuable. It should be less than 56 characters including spaces. The length is actually calculated in pixels so if you are using a lot more M’s than I’s then this may be less. The earlier in the title tag your focus keyword is, the better so “Agency search and selection – TrinityP3” is better than “TrinityP3 – Agency search and selection”. Again, this is not the place to play keyword manipulation games. There are way too many sites that make the mistake of trying to get multiple keywords into this field. Think of your meta description as your selling space. This is where you get to entice potential visitors to click through to your page. You can ask questions, you can be provocative, you can create intrigue. Headings are another critical element that search engines look at when crawling a page. There is a hierarchy for these headings and each one has an HTML tag to show the level of importance. H1 is the most important then H2 then H3 and so on. There should only ever be one H1 on any page and this should affirm what the title tag says. H2’s and H3’s should ideally be closely relevant and should expand on the main topic. The other advantage of this structured approach is that many visitors will scan a page first to get the overall theme from the sub-headings. Then they will often decide to read specific sections or return to the start to read in full. So we are giving a very useful user experience with this point. If your sub-headings can follow a narrative this is very useful as well. Search engine robots have a very limited understanding of images. This is changing slowly and at some stage a large range of images will be recognisable – but not yet. So we have to tell them what the image is about. Assuming the image you have selected is closely related to the topic of the page this is relatively easy to do. Add a descriptive alt tag that tells search engines what the image is about and look at how closely it ties with the page. Missing alt tags are a common problem on many websites. This is still one of the most important SEO skills. If you don’t have an understanding of the popularity of particular phrases your content strategy will be hopelessly off target. It is also one of the most overlooked elements. There are a range of good keyword research tools available but you can do a good job using Google’s Adwords keyword planner, Google suggest, Google auto-complete and Ubersuggest. You may be surprised that the phrase you thought everyone would use to search for your service or product is actually insider jargon and no one other than your competitors use it. Or let’s say you are investing in a major piece of content. Doesn’t it make sense to ensure people are actually looking for what you are creating? Good, solid keyword research is what leads to a valuable archive of evergreen content that continues to bring relevant people to your websites. Once the research is done a list of valuable targets can be created. This can be a topic suggestion list and the appropriate expert from the company can use this to craft new content. This helps with the “But what should I write about?” content writing block and ensures that we are not wasting our time with content that has a very short lifespan. If we do not continually measure results we have no idea whether what we are doing is working or not. Why would you invest all of this time and money if you can not report growth and ROI? We look for any anomalies in traffic trends and analyse the most successful content to inform future strategy. The idea with all of these is to test, measure, analyse, report and then to repeat the process. If a particular strategy is not bringing a return then we can shift focus to others. The data allows us to be agile in our approach. Our link building strategy has been entirely passive. We focus on creating great content and we promote it effectively and this is a large part of how we earn high quality, relevant links. As TrinityP3 is an influential participant in the advertising and marketing world there are also a range of other opportunities from trade and media plus Darren Woolley’s gruelling speaking schedule ensures that high brand presence leads to many more naturally obtained links. Google’s Penguin update punished a large number of manipulative tactics used by many in the SEO field. Links from low quality sites and repeated keyword rich anchor text saw a massive number of websites penalised. This spelled the end of low quality directories, comment spam, blog networks, spun content, article directories, forum signature spam and more as viable long-term strategies. 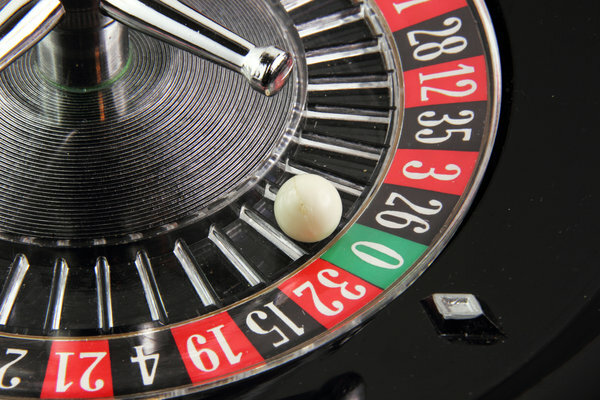 It also led to the emergence of an entirely new industry – penalty removal. A business that has a long pedigree and that has owned a domain for a decent number of years will be looked upon as a trustworthy option in search. This is where authority comes into it. An authoritative site is created by a strong offline presence (media, trade and other citations), a highly visible and engaged social media presence and by the quality of the websites that link to it. All of these signals are essential but if you do not master the next section your results may be disappointing. This has become a foundation requirement. Simple mistakes will punish your rankings and your business results. 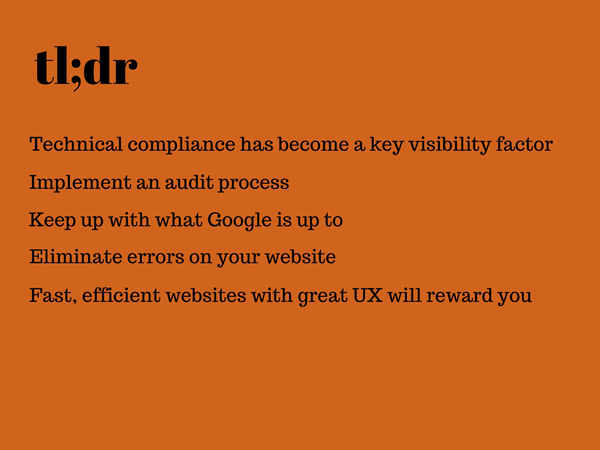 Google is looking for fast, clean, efficient websites that have high authority signals. So, you better get the technical stuff right. These have become a necessity. With the ever changing landscape that is search and with an increasing complexity of website code, platforms, browsers and the frantic pace of change anyone who is not auditing regularly is at risk. Large numbers of crawl errors relating to previous versions of websites or duplication that relates to previous URL structures can suddenly appear in Webmaster Tools and Bam! Drop in trust, drop in page positions, drop in visibility, drop in business. It is impossible for anyone to predict the wild nuances of web behaviour so you need to be constantly monitoring and reacting to the information you are given. An SEO audit outline is detailed here. Despite Google’s public commitment to being fair and transparent the reality is that Google derives its existence from advertising revenue. This revenue is protected by the ability to give the best possible results for any search. So too much transparency leads to hackers and spammers destroying the user experience which eventually leads to people looking for alternatives (and reducing ad revenue). What Google says may not always be what Google does. So we need to watch tools and experts who spend every second measuring across massive data sets to get an understanding of what are temporary or unintended aberrations and what are major unannounced shifts in policy. Mozcast measures and publishes the volatility of Google’s results using a weather metaphor. This is one of many tools that track thousands of keywords to analyse when Google is making adjustments or major changes to the algorithm and what they mean for different industries. Tracking the right forums is useful as well. Unfortunately many of these are overwhelmed with spammers trying to undo penalties that have crippled their businesses. The important thing is to keep up with what is going on. I have seen way too many development/design/IT companies using outdated and dangerous practices simply because they are not keeping up with the play. In a recent case I was called on to audit a new site for a district council. The IT people who drove the project had taken Google’s webmaster blog post around crawl errors literally. i.e. Letting pages go to a 404 page should not affect ranking. The reality is that if you have a sudden influx of “Not found” errors or if there are a significant number of pages that go to a 404 page (not found) then the algorithm will make an assumption (if machines can make assumptions) that your site is not giving a very good user experience due to the number of broken pages encountered. In the case of the district council site it was cut down from 2000 pages to 400 but no 301 redirects were implemented to take search engine robots to the most appropriate page or to refer all of that valuable history and authority. So the site crashed to a 25% drop in traffic and questions were being asked about the investment in the new website. Take my word for it – crawl errors do matter. This is a beauty. Duplication used to be (and still is for some black hatters) an easy hack for multiple search engine positions. Publish the same content on multiple platforms or have multiple pages on your site with basically the same content but different anchor links and Boom! Instant business. Google’s Panda Update hit this practice and eliminated a lot, but certainly not all of this tactic. The unintended consequence of this hunt for spammers was that normal functions of many CMS were hit by a drop in trust. Normal functions of websites including archives, categories, tags and dynamic versions of pages were suddenly a cause for concern. Some platforms like WordPress had the advantage of plugin developers who understood the intricacies of noindexing certain taxonomies to avoid these issues. Others we have had to help with recommendations for each type of duplication issue. The interesting thing with all of this is that Google does not care if your website is hit in its quest for quality in search results. Google makes the rules and if you want traffic from that source you better adhere to the rules (spoken or not). If duplication is an issue on your website you need to fix it. This is a relatively new requirement in technical SEO. It became obvious that websites that loaded slowly for whatever reason were frustrating users. None of us want to wait for more than a few milliseconds for a page to load. The unfortunate thing is that so many web developers and designers are focused on huge images and have no idea about how to manage the downside of these big statements. Big visuals and video take up big bandwidth. Try running your website through Google Developers Pagespeed Insights. You may be shocked by what you see. A slow site will be dropped lower in page positions despite your awesome content. Google knows that bounce rates are not a particularly accurate measurement of visitor satisfaction. In fact most high quality blogs have a bounce rate of 80% plus. (a bounce means when a visitor visits just one page then leaves again). This is because these visitors are arriving mainly due to social media promotion – they see something interesting, they click, they read, they leave. Nothing wrong with that user experience. So the more important metric is time on page. Did the visitor take the time to read and get to know the piece or was it a quick and unsatisfying relationship? And we have all experienced those click bait posts that take you to sites that once you get there you have to click a next button for each of the slides you have been coerced into viewing. In this case low bounce rates = terrible user experience! It is better to use a compelling call-to-action to take visitors to pages that will matter to them than it is to trick them for your data analyst’s pleasure. There is a choice. You could have a mobile website (after all Facebook does it) or you could have a responsive site that serves up the right design for each device and screen size. Mobile sites, despite their economic benefits, are a tough task for SEO. You effectively have a duplicate site and even if you change the metadata the site will remain a nice copy of your main website. So, responsive is the way to go. But there is good responsive and bad responsive. Some of the top rated website themes deliver terrible mobile experience so you need to work with a developer who understands how users interact on different devices. This is in the technical compliance section because badly managed mobile sites will fit into the duplication penalty section. Nightmare number one. This is where you can feel completely helpless. You have been recommended a good hosting company and you host your site with them. Or, you let your developer host it (and click the ticket on the way to a host you might have chosen). Your website has gone, or intermittently you get a “database error” or some other strange thing. How can this be? You are paying the fees. These guys are supposed to know what they are doing. Your business relies on your website being available at least! Server issues can be one of the most fraught areas we deal with. The language is incomprehensible, response times poor, solutions vague. So you have to act quickly. As soon as there are issues with server response or DNS you need to get right up in the face of your hosting company. If you have shared servers do not accept any fob off. If you have your own virtual servers then there is no excuse. 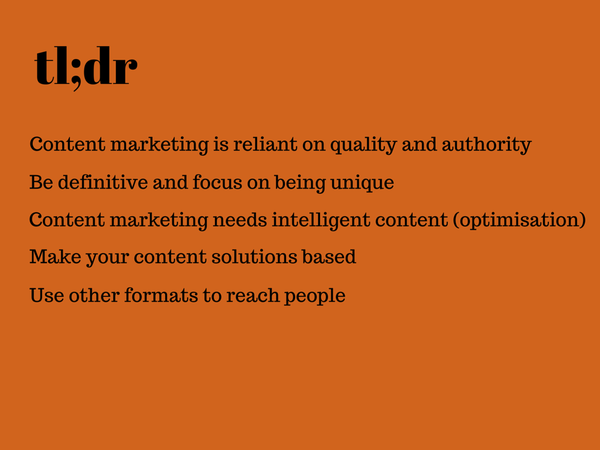 Despite this being the third section, TrinityP3’s content marketing strategy is the primary reason for all the outstanding results. Originally this was driven by content from Darren Woolley alone but over time we have broadened the scope to take in experts from a range of fields and industries who all have something of interest to the TrinityP3 audience. I’m sure you are bored with hearing the old cliche “content is king” but phrase it however you want this is the essence of inbound marketing. Without extraordinary, unique content you are going to be lost in that sea of ordinary. So we set the bar high. Fortunately, each of our contributors have either been invited or they are TrinityP3 consultants with a high level of expertise in their area. We have ignored or declined politely the incessant approaches from “guest bloggers”, from SEO out-reachers, from PR firms and from people who simply wanted to leverage TrinityP3’s high online presence. To be published on TrinityP3’s blog you need the credentials and the insights to bring value to our audience. We can bring people to the website from search engines and social by targeting particular topics but building relationships and building a loyal audience is many times more valuable. So the first priority of our content strategy is quality. Darren Woolley has written an astonishing 821 posts as of the publishing date of this post. Top contributors from within TrinityP3 are Anton Buchner on all things digital and data, Nathan Hodges on the pitch and strategic alignment, Clive Duncan on the world of TVCs and production, Anita Zanesco on the pitch and chemistry sessions, Chris Sewell writes about sustainability in business, I write about SEO, content marketing and social and there are a number of other consultants who contribute periodically on their specialist fields. From outside we have contributions on marketing management from Marketing FIRST Forum member Stephan Argent, Deb Giampoli from Mondelez International, David Little – procurement professional, Shawn Callahan – Storytelling for business expert, Andrew Armour from Benchstone, Craig Hodges from King Content and a who’s who of procurement, marketing and agency management. This multi-author strategy has built our “many voices” tone and has allowed us to speak on a multitude of relevant topics. You will not find a short, sharp post on the TrinityP3 blog. If you are here you better be ready to be informed. In a comprehensive and fully researched way. Our commitment has always been to providing definitive information. Remember at the start I said that “Knowledge is power” was the key? Of course the reality with inbound is that the more expertise and the more knowledge you can demonstrate the more trusted you become as a partner of choice. Those people who are holding back never get the chance to show their stuff. So the blog has become the go-to place for opinion, insights, step by step processes, solutions and much more. And the insights are not off-the-cuff. They are researched, tested, proven. You may have an insight that the whole world needs to hear. It could be a game changer. But, if you do not optimise your content correctly then search engines will politely index but never show your content to anyone ever again. Intelligent content is not about the words or the images, intelligent content is how you create, manage, and deliver your content. You can have the best content in the world, but if you can’t get it out to your customers or prospects at the right time, in the right format, and on the device of their choosing, it doesn’t matter how good your content is. Communicators spend too much time handcrafting content for a channel, then handcrafting that content over and over again for each additional channel. This isn’t sustainable. We don’t have the resources or the time and we can’t afford the cost of this error-prone process. Learn how to optimise content or partner with someone who does it well. Keyword research – are people interested in what you are saying and how can you use the right language to reach more people? the URL – is it the best it can be? The large majority of TrinityP3’s visitors come from optimised, evergreen content that provides solutions. Each one of these posts is an asset that brings interested people from all around the globe to our site. There is such an avalanche of content being produced. Did you know that there are two million blog posts published every day? So, how do you stand out in the maelstrom? How do you ensure your content is not just indexable, but viewed as a desirable solution? The answer is uniqueness. With so much content being produced your opinions or research can not be a close match to content found elsewhere. Be different. Be challenging. Be provocative if need be. Develop a unique voice and style. Don’t recycle. Don’t reword other people’s content and call it you own. Don’t be boring. A big advantage for your content is when it supplies solutions for your industry pain points or areas of confusion. If we analyse TrinityP3’s top posts the majority of them explain specific processes or challenges. The most popular post of all time asks the question Top down or bottom up budgeting – which approach is best? These posts and others are evergreen meaning that they do not date and they will continue to attract a substantial number of visitors from organic search. Note how they are all solutions focused. We have stuck to a publishing schedule of 3 posts per week since the beginning of the project. Sometimes we can run it pretty close to the bone and there have been times where I have been burning the midnight oil to get a post ready at short notice if we are running low. The paradox is that the inbound marketing strategy has caused such an increase in leads and business that Darren and the consultants are often under the hammer time-wise as they are busy working on client business. As a rule we do like to have a good number of posts waiting in draft form and we select the most appropriate three at the end of the previous week. 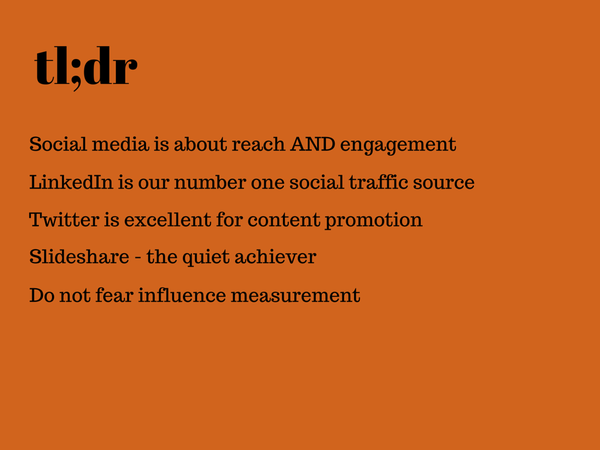 That gives us a bit of time to create the social media introductions and to proof, edit and optimise each post. Final checks are made on the morning of posting then we are good to go. This commitment to deadlines and our content schedule sends some pretty powerful freshness signals to Google. Content is indexed and ranking highly within hours of publication. It is not enough to simply hit publish and hope for the best. Amplification is a crucial element of the content marketing process. As soon as the new post is published it gets promoted across multiple LinkedIn, Twitter, Facebook and Google+ pages. The combined reach of these pages is more than 120,000 people. This social media promotion has a two-fold advantage. It allows great visibility and it sends powerful popularity signals to search engines. This adds to the speed of indexing and the high page positions attained. Retweets, shares and mentions all add to the reach of the content. If you take a look at the majority of posts on TrinityP3 you will see a healthy amount of sharing. We have an engaged audience who share our content on a regular basis. Look at the shares on Debra Giampoli’s post – 474 shares on LinkedIn alone. To push things along we also ping 89 search engines and submit each post manually to Google via Webmaster Tools. TrinityP3 published its first paperback and ebook at the end of 2013. The Marketing Management Book of the Year 2013 was extremely well received and sold out of its print run. So we repeated this with The Marketing Management Book of the Year 2014 at the end of 2014 and it is selling out fast. This move into print has been really interesting. People still love the tactile joy of owning and reading a physical book. Something to add to your bookshelf alongside all those essential marketing, business and strategy books. So it has been a huge success and we will continue to publish this book annually. We also published Senior Consultant Anton Buchner’s comprehensive ebook on digital and data called The Ultimate Guide to Digital Marketing in a Data-driven world. So far 310 copies of this ebook have been downloaded since it was published at the beginning of November. Is creativity valued? And if not, how should it be? Darren discussed the three types of consulting here – Rocket Science, Grey Hair and Process. As part of a strategy to embrace all three, rocket science needed to be a strong point of difference between TrinityP3 and its competitors. So there have been a number of tools and platforms developed to help marketers to achieve more efficiency, more effective relationships and better results. TrinityP3’s calculators are one of the most visited pages on the website. So we developed a free mobile business app so marketers could check figures on the go. Evalu8ing was launched which is a true 360 degree relationship management tool that helps identify problem areas and improve relationships. Unlike most online tools this one allows you to evaluate the relationships between up to 8 groups. Ad Cost Checker allows you to calculate and benchmark agency rates on the fly. The huge database that TrinityP3 has collected and uses for this tool means that you can see how close you are to industry standards very quickly. No more guess work when it comes to marketing spend. Watch this space as there is more to come in 2015. The past couple of years have seen a rapidly increasing demand for Darren Woolley’s keynote appearances, presentations and panel discussions. The air miles getting clocked up are pretty impressive and the number of events is far too long to list here so we have chosen a few of the more recent ones as examples. October 2014 – Norway – ANSO Conference – Talking about bringing value back into marketing and advertising to 350 Norwegian Marketers in Oslo. Finding that everyone has similar challenges and issues. March 2014 – Australia – Content Marketing Seminar – Filling a room with almost 300 marketers and agencies to discuss effective content marketing and then donating the funds raised to the Charlie Teo Foundation. Then going on to replicate this in Melbourne and Singapore. April 2013 – Canada – Association of Canadian Advertisers – Talking to a group of major media advertisers on how their current remuneration model for their media agencies is failing to deliver real value and getting universal agreement. November 2014 – SAGE (Secrets of Agency Excellence) – Telling rooms full of agency management in Sydney and Melbourne that most, if not all, were factories producing the collateral that filled the advertising space of most media adding little or no value at all – just crap. And TrinityP3 has been featured too many times to list in local and global advertising and marketing sites such as Mumbrella, Adnews, Campaign Brief, CMO, WARC and more. These comprise both news pieces and op ed. Social media has been a key strategy for TrinityP3 and the platforms used have continually changed over the past 3 years. There are still a large number of people in the industry who are a bit lost with social and this is exemplified in the contrasts between over and under sharing and in the lack of a decent sized network for many. Without a good sized network, any engagement strategy is ineffectual. These should not be numbers for numbers sake though but should be carefully considered and hand selected. Here is a quick rundown of the social platforms and how we are using them. LinkedIn is our number one source of social media visitors to the website. Darren’s personal LinkedIn network is 6,649 as at 15/1/2015. The TrinityP3 company page has 778 followers. The focus is on sharing high quality content from the TrinityP3 blog and from other relevant sources. Discussions are started in LinkedIn Groups that are related to the subject matter and there is good engagement on posted content on the personal profile. LinkedIn publishing drove a lot of visitors when it was first launched in 2014 and led to the re-emergence of a couple of archive posts which hit the monthly top 10’s. As this progressed and a massive number of people began publishing the view numbers declined sharply. I’m sure you have all seen and begun to get irritated by the number of people who “have just published a post”. We will test this one again in 2015 to see whether it is worth pursuing. Twitter is not far behind LinkedIn and this goes to show how effective Twitter is as a content platform. We get a high number of people checking out blog posts from Twitter and this proves the importance of a well-thought-out and compelling title. We use Hootsuite and Buffer to schedule a range of content daily across 12 Twitter accounts. The flagship content account is @TrinityP3 and this has the highest influence scores. Every day we select content from TrinityP3 properties and from advertising related sites around the world. Real mentions (not spam) are replied to and we still take the time to thank every person who shares our content (although we do it in blocks so we don’t clog up the feed). This year we are developing a new engagement strategy to lift the levels and will be using a couple of new and innovative tools for data analysis and interaction. Twitter has been a great way to connect with others at conferences and events. Following the event hashtag means that opinions and observations on the speaker are shared in real time and the conversation can be followed by others who are not at the event. The feed can get intense on these occasions but the connection and sharing of views with others is invaluable. Slideshare is a very strong channel for TrinityP3. The presentations get a very high number of views and the channel has 272 followers. TrinityP3’s YouTube channel houses a combination of agency and client testimonials, speaking engagements, explainer videos and a series of specially created interviews with TrinityP3 experts. The videos uploaded here are also repurposed as blog posts with introductions and transcripts so this adds to the content strategy. Most people will tell you that Facebook is not particularly effective as a B2B platform. And there have been times when we have come close to shutting down TrinityP3’s Facebook page. But each time we do we look at the numbers of visitors that are coming from Facebook and the fact that for some people in the industry this is their only social channel and we decide it is worth continuing. Facebook has continually reduced reach over the past couple of years so we pay a minimal sum to boost each post. The small budget allocated at least allows us to reach those people who have liked the page. We have a reasonable presence on Google+ but in 2014 we used it primarily as a content sharing channel. Our strategy in 2015 will be much more about engagement. One of the big advantages of Google+ was removed by Google in 2014 and that is authorship. It was a big win to have an author image appearing next to your content in search and to have the number of people who have you in circles below the title. Conventional wisdom points to these results being too effective in attracting clicks and this was detracting from the number of clicks on paid search ads (Google’s bread and butter). There is still some debate about a Google patent for author rank and many think that this is already a part of the algorithm. But the reality is that in this high paced, time-poor, crowded environment you sometimes have to be selective about who you spend your time with. In business you have to spend your time on those that could become clients or could effectively share your ideas or could be brand advocates. And a quick way to gauge influence and reach is through influence measurement tools. US content marketing thought leader Mark Schaefer published an essential book called “Return on influence” which dispels some of the emotive reactions to this type of social proof. Check it out. Klout is probably the most widely used and it can save a lot of time in social media management. As an example, a Twitter user mentions you and they seem a bit spammy. If you are in Hootsuite you click the user name and you get the Klout score if any and the number of followers and tweets. No Klout score, thousands of tweets, almost no followers = spambot. Another tool we are beginning to use sorts all brand mentions, hashtags and focus keywords by sentiment and influence. So at a glance you can see whether someone influential has said something positive or negative about you. This allows quick response and is very useful for reputation management. And yes, Klout can be gamed. Some of the people who have the highest numbers of followers have achieved it through dubious means and they inflate their scores by tweeting every second of the day. But for the most part it is a reasonable and useful guide. I have tried to be as complete as possible with this strategy account but there are also a lot of aspects that I have had to leave out. We work closely with Darren and the TrinityP3 team on a daily basis. We discuss strategy, we test and learn, we try and fail and we implement and succeed. It is a great pleasure to work with people who understand the value of inbound strategy and who understand the intricacies and complexities of digital marketing. This whole engine moves forward thanks to the efforts of a number of people but I have to single out Darren as without his incredible capacity to produce a huge amount of exceptional content none of this would have been possible. Thank you also to the TrinityP3 consultants and admin and technical staff. Thanks to all external expert contributors. Thanks to our team at High Profile Enterprises – Midge, Gina, Wayne, Holly and Andrew – for their hard work and expertise. And thank YOU for being one of our readers and for contributing to the incredible success of this project. We look forward to 2015 and beyond and hope you will enjoy the ride with us.